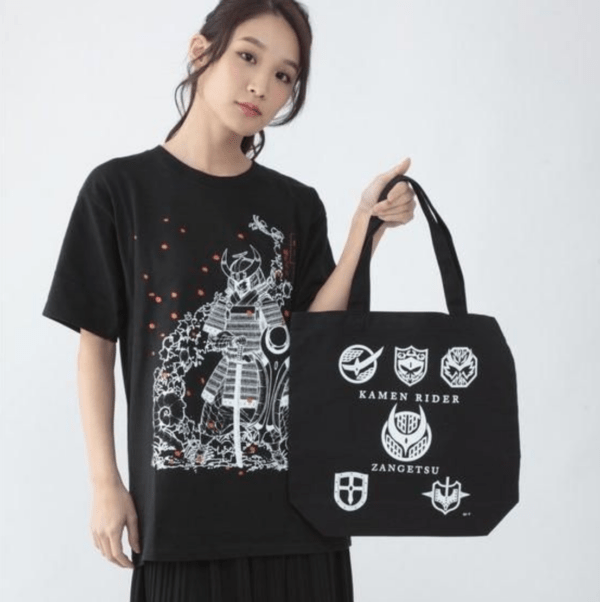 Premium Bandai announced the release of various merchandise in honor of the Kamen Rider Zangetsu -Gaim Gaiden- Stage Show. 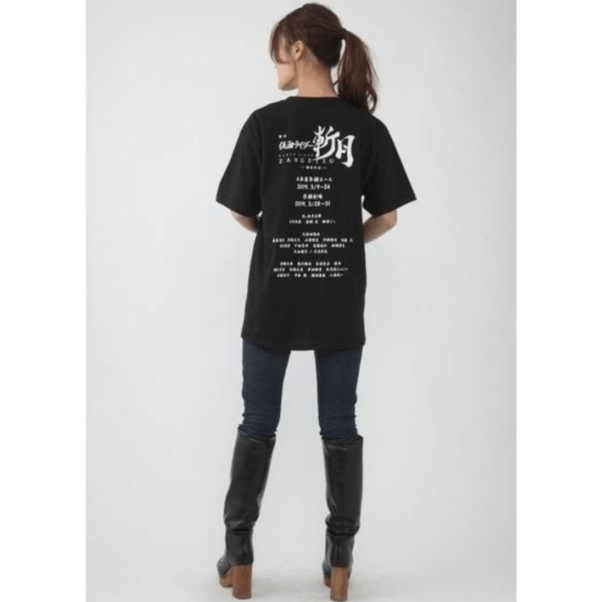 The first item listed is a Kamen Rider Zangetsu -Gaim Gaiden- Stage Show T-shirt. 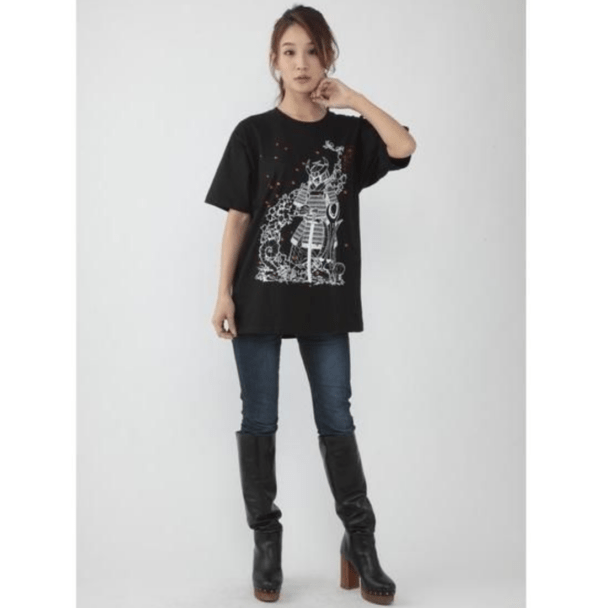 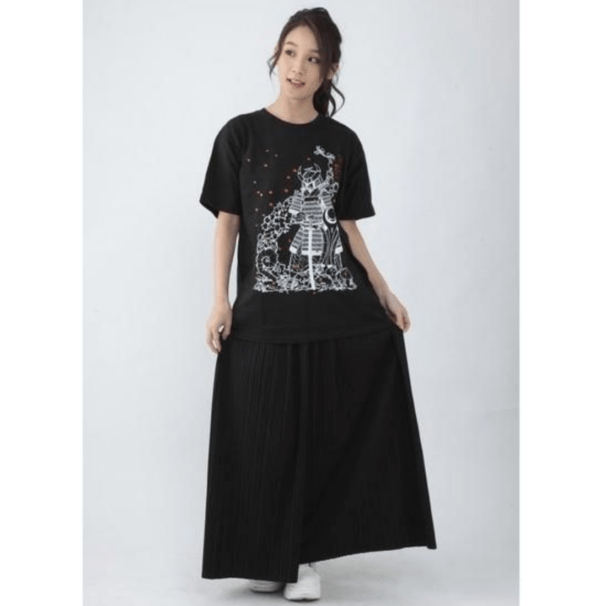 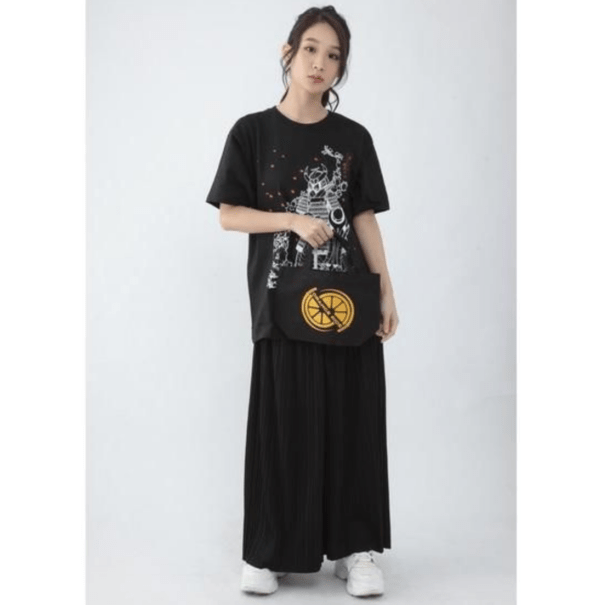 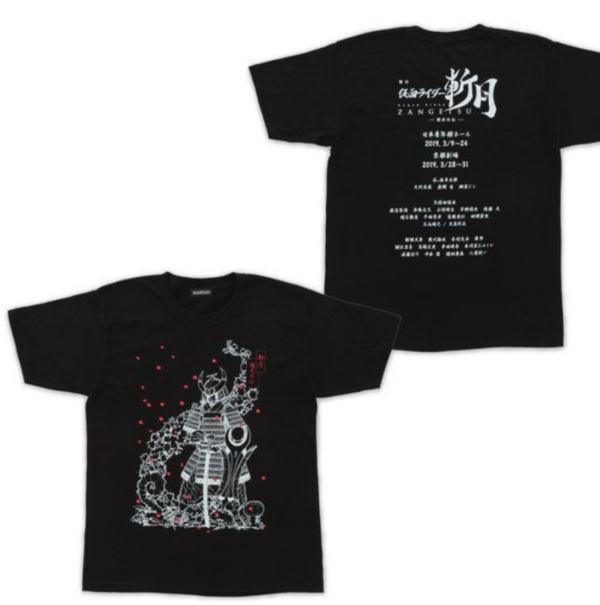 The t-shirt features a Ukiyo-e style illustration of a Kamen Rider Zangetsu inspired warlord and the back has the names of the cast of the stage & the credit of the staff. 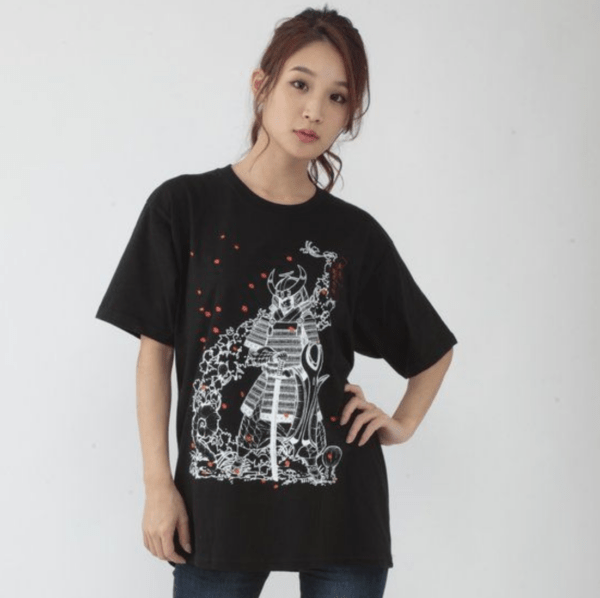 The t-shirt is made of 100% cotton and come in sizes M (US S), L (US M), and XL (US L). 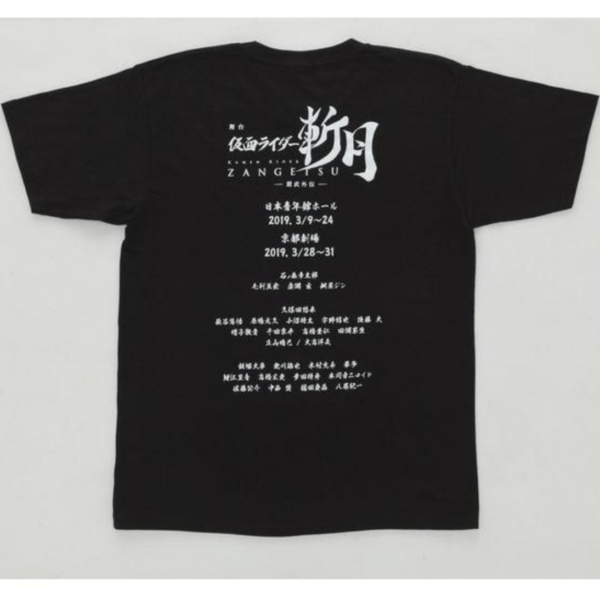 The Kamen Rider Zangetsu -Gaim Gaiden- Stage Show T-shirt will go for ¥3,780 (tax included) and is scheduled for shipment in May 2019. 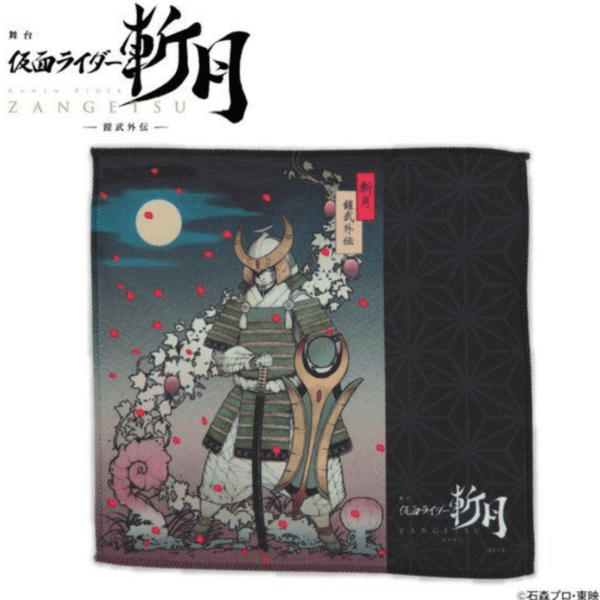 The next item listed is the Kamen Rider Zangetsu -Gaim Gaiden- Stage Show handkerchief. 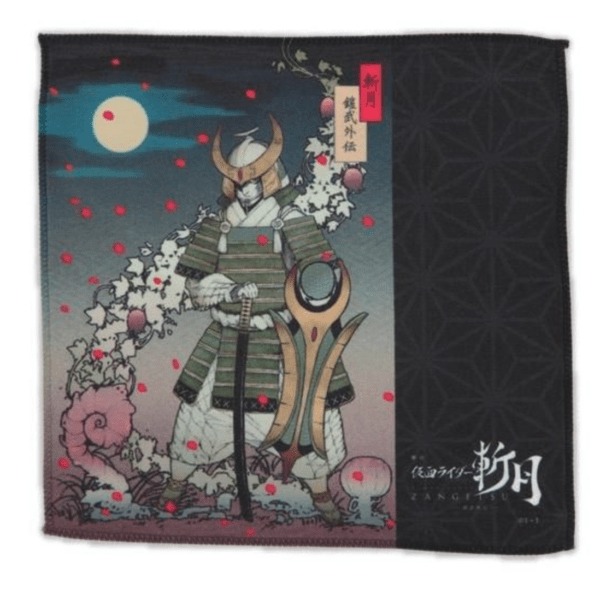 This handkerchief is a mini-cross designed with a Ukiyo-e style illustration of a Kamen Rider Zangetsu inspired warlord. It is also water-absorbent and can be used as either a handkerchief or eyeglass wipes. 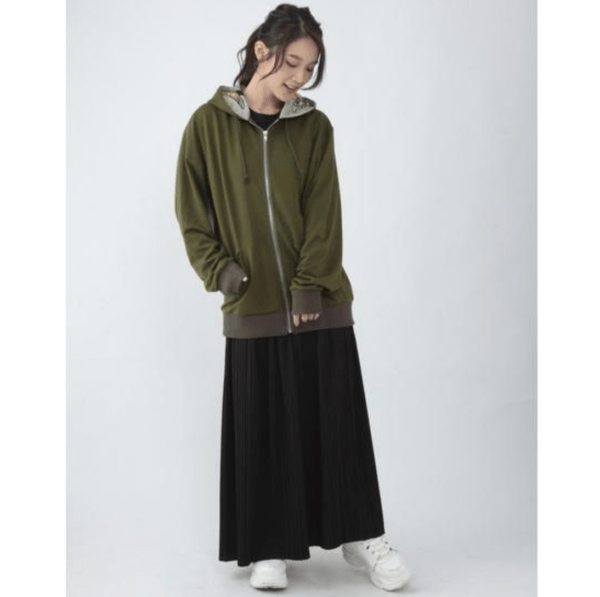 Because it is thin, it is very convenient to have one bulky sheet. 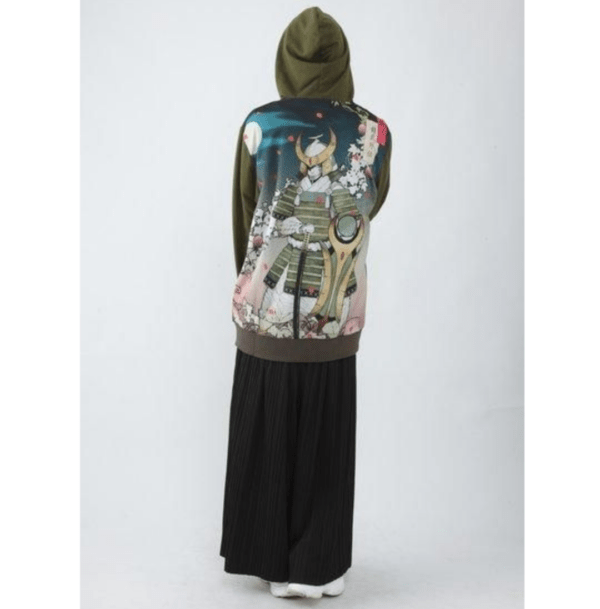 The size is about 200mm × 200mm and is made of 90% polyester and 10% nylon. 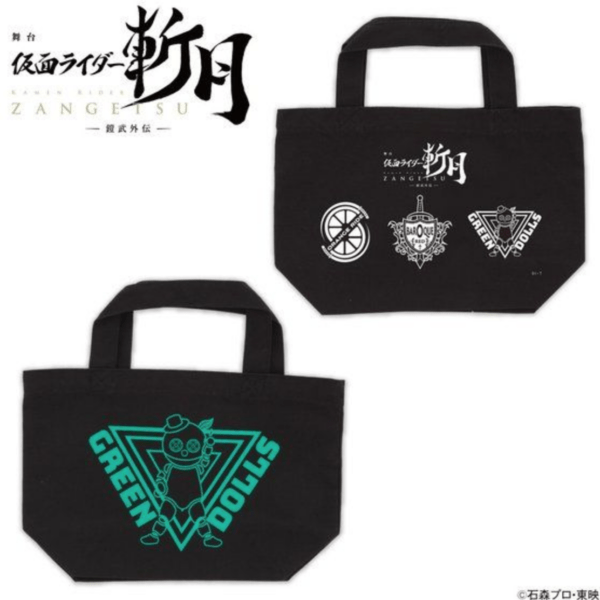 The Kamen Rider Zangetsu -Gaim Gaiden- Stage Show handkerchief will go for ¥540 (tax included) and is scheduled for shipment in May 2019. 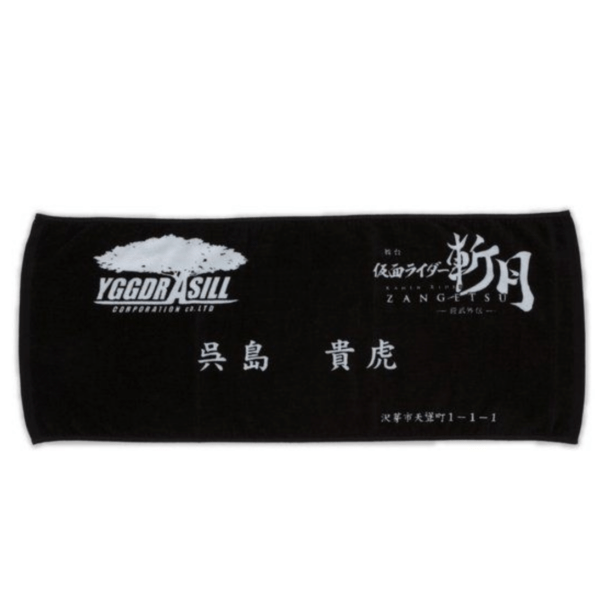 Futhermore, we have Kamen Rider Zangetsu -Gaim Gaiden- Stage Show Embroidery Mini Towels. 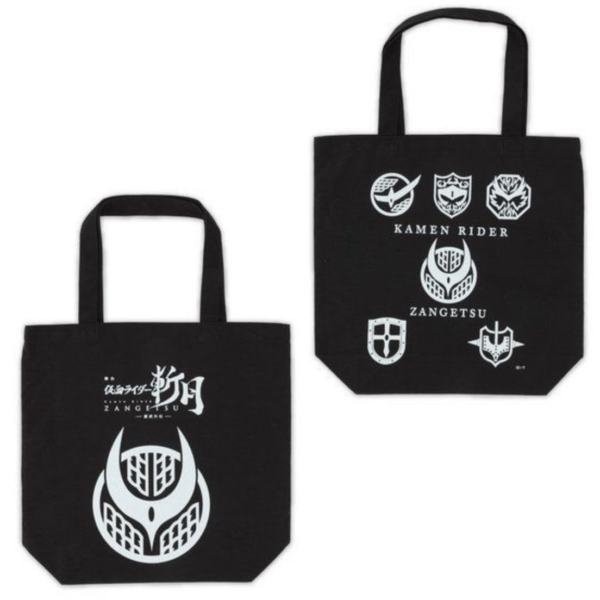 The mini towels come in two designs: Kamen Rider Zangetsu and Orange Ride. 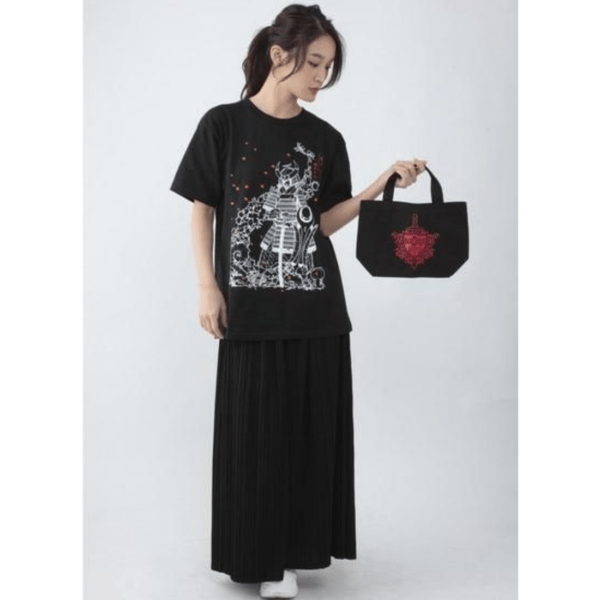 The size of each is about 25 × 25 cm and both are made with 100% cotton. 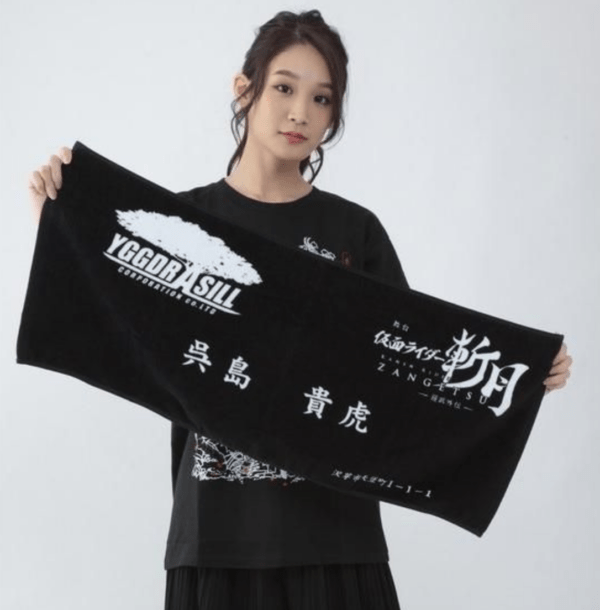 The Kamen Rider Zangetsu -Gaim Gaiden- Stage Show Embroidery Mini Towels will go for ¥1,080 (tax included) each and are scheduled for shipment in May 2019. 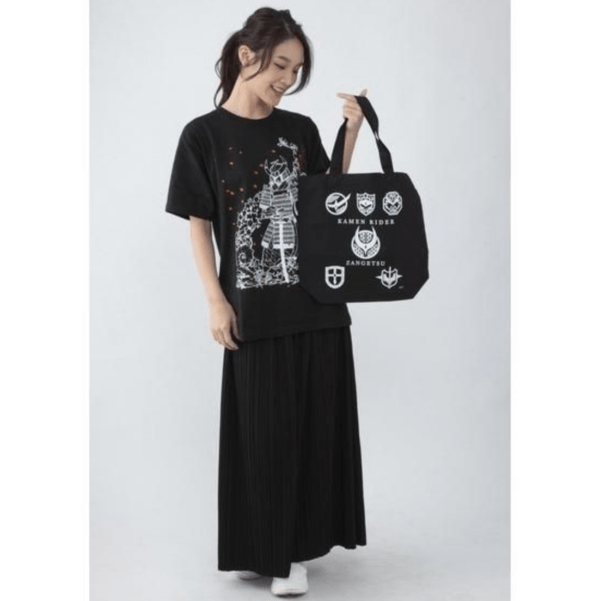 Following the embroidery mini towels, we have the Kamen Rider Zangetsu -Gaim Gaiden- Stage Show Tote Bag. 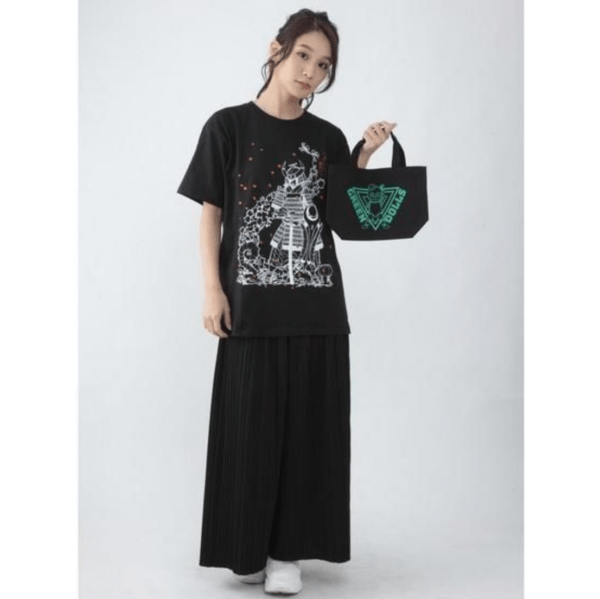 The tote bag is an A4 size tote bag designed with the mark of Zangetsu. 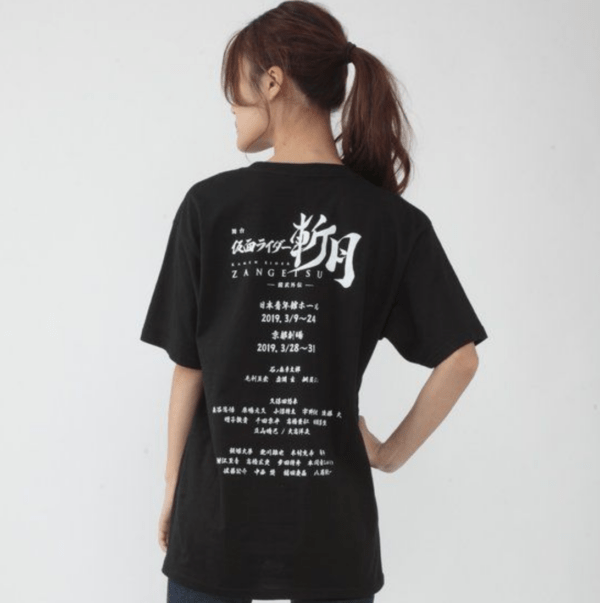 On the back is the logo of the other teams that also appear in the stage show. 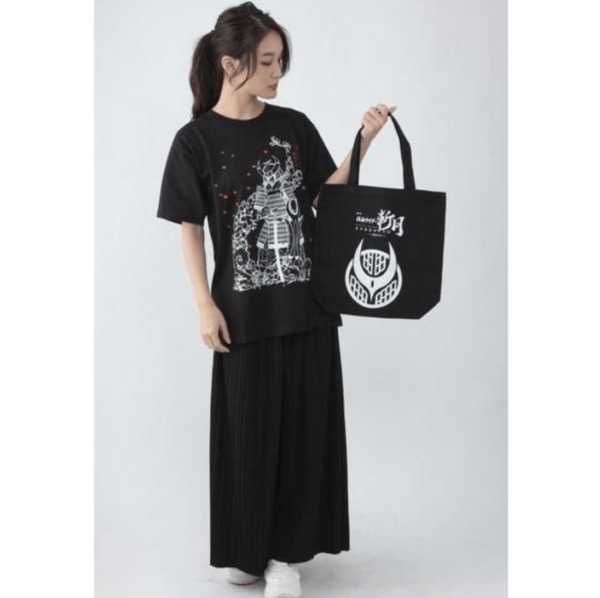 With a simple design of white print on black, it is easy to use casually. 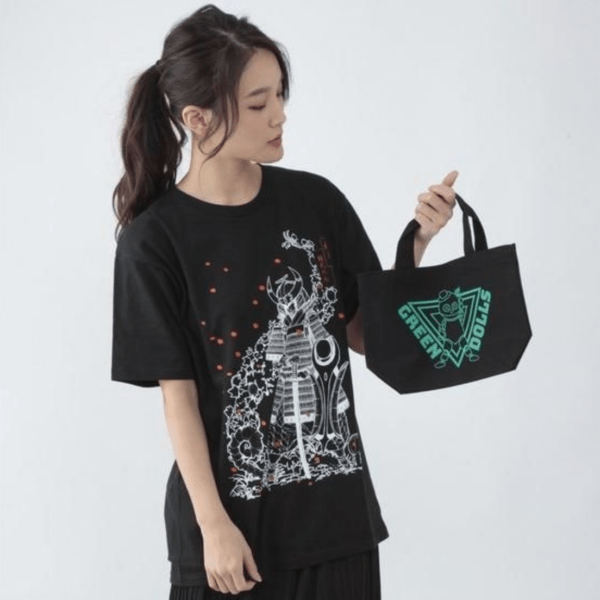 The size of the tote bag is 36 cm (Width) x 37 cm (Height) x 11 cm (Diameter) and is made of 100% cotton. 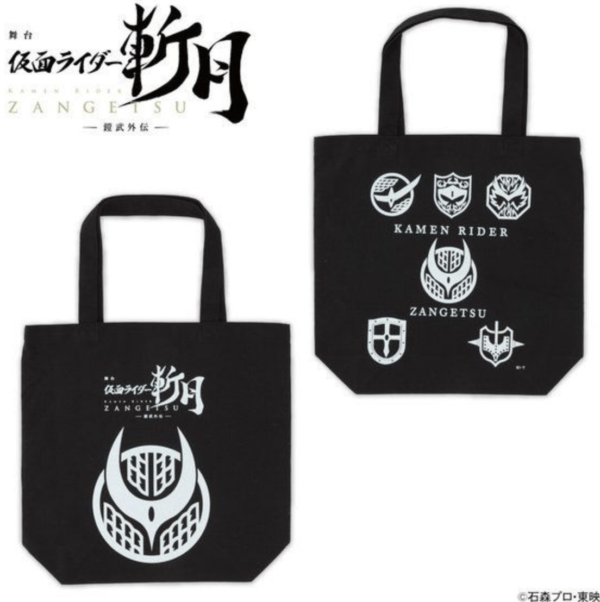 The Kamen Rider Zangetsu -Gaim Gaiden- Stage Show Tote Bag will go for ¥2,160 (tax included) and is scheduled for shipment in May 2019. 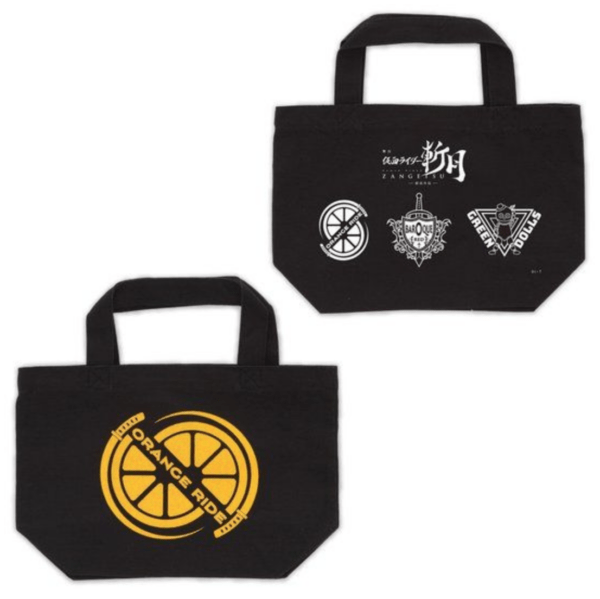 After that, we have the Kamen Rider Zangetsu -Gaim Gaiden- Stage Show Mini Tote Bags. 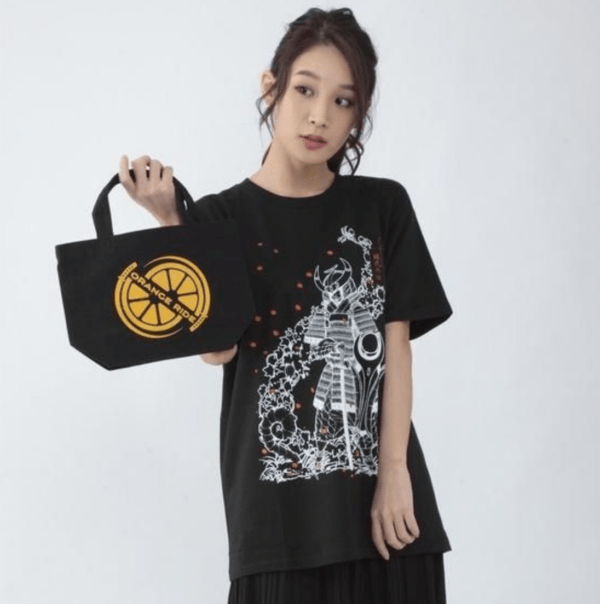 The mini tote bags come in three designs: Orange Ride, Green Dolls, and Baroque Red. 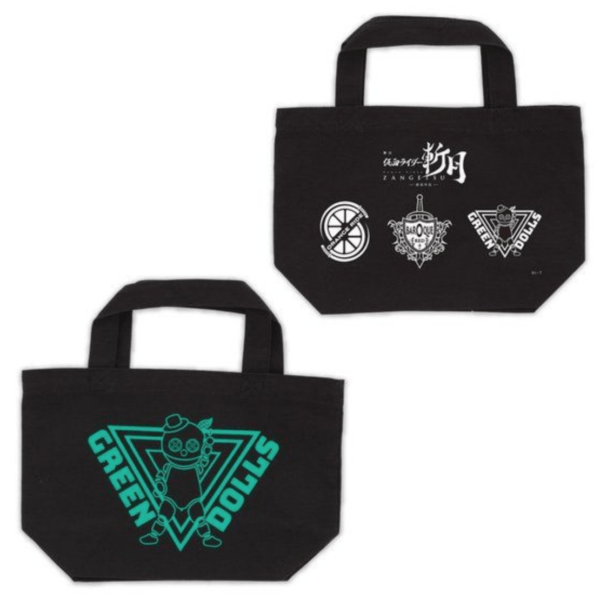 Each is a mini tote bag in which the team mark appearing on the stage is designed. 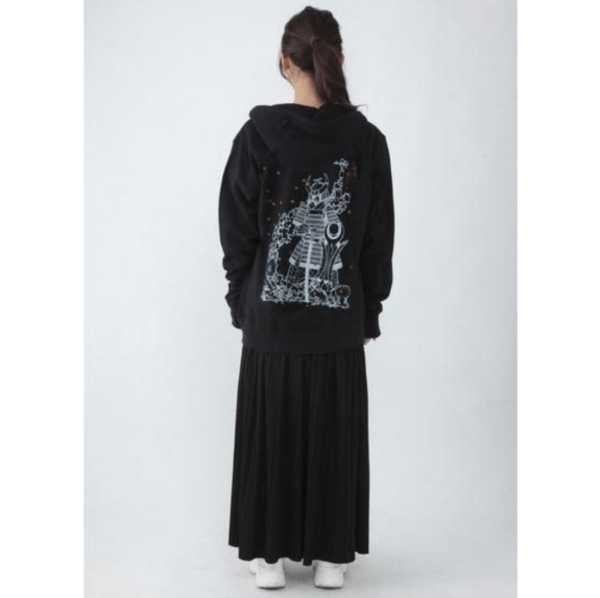 The back features the stage logo. 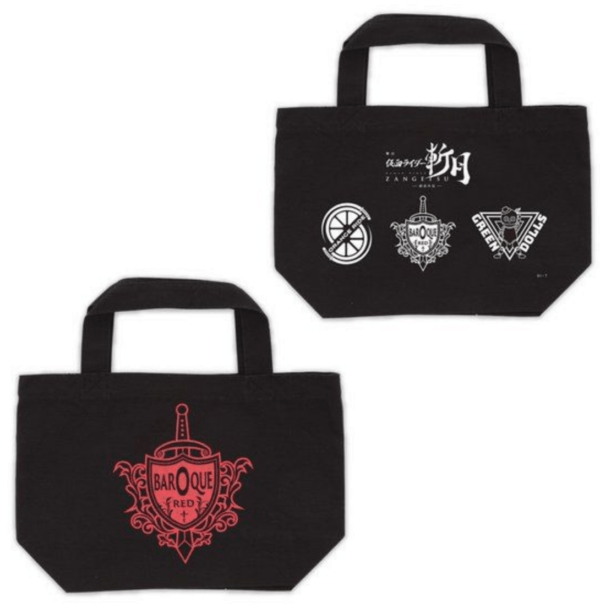 Each can be used as a lunch tote as they are sized to be used for lunch and other small excursions. 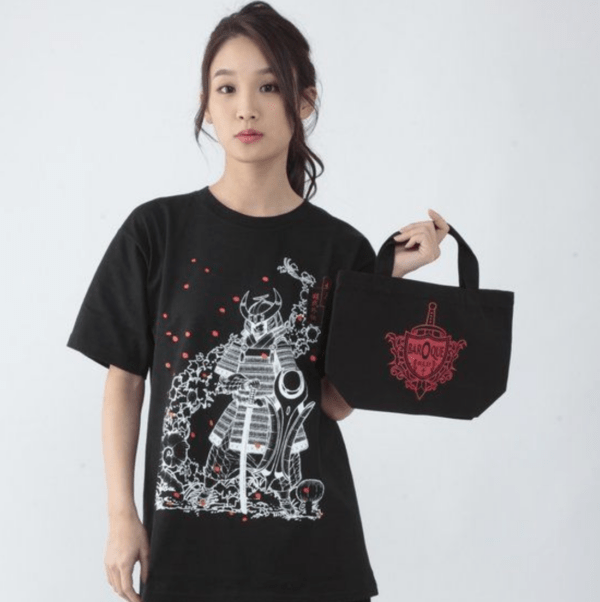 The size of each of the mini tote bags is 30 cm (Width) x 20 cm (Height) x 10 cm (Diameter) and are made of 100% cotton. The Kamen Rider Zangetsu -Gaim Gaiden- Stage Show Mini Tote Bags will go for ¥1,620 (tax included) each and are scheduled for shipment in May 2019. 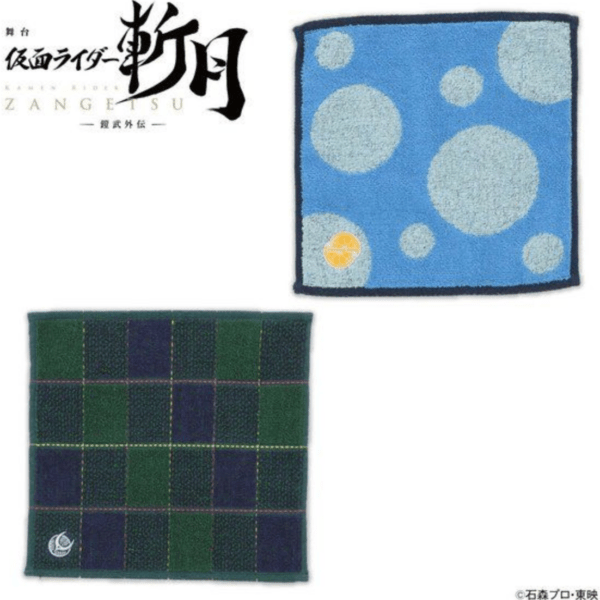 Next, we have the Kamen Rider Zangetsu -Gaim Gaiden- Stage Show Takatora Kureshima Business Card Face Towel. 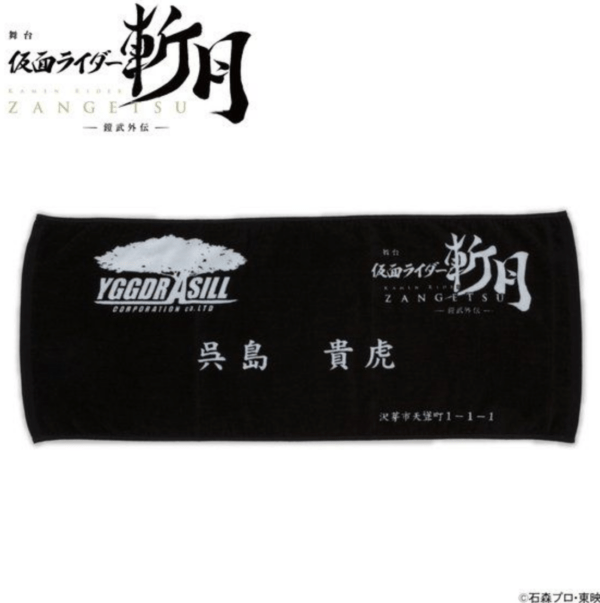 The face towel features a black version of Takatora Kureshima/ Kamen Rider Zangetsu’s Yggdrasill Corporation Business Card design. 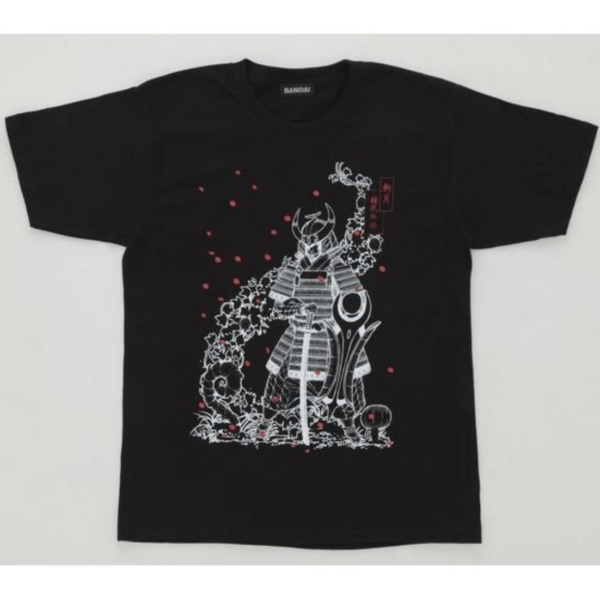 The size is about 34 cm vertically and about 85 cm horizontally and is made of 100% cotton. 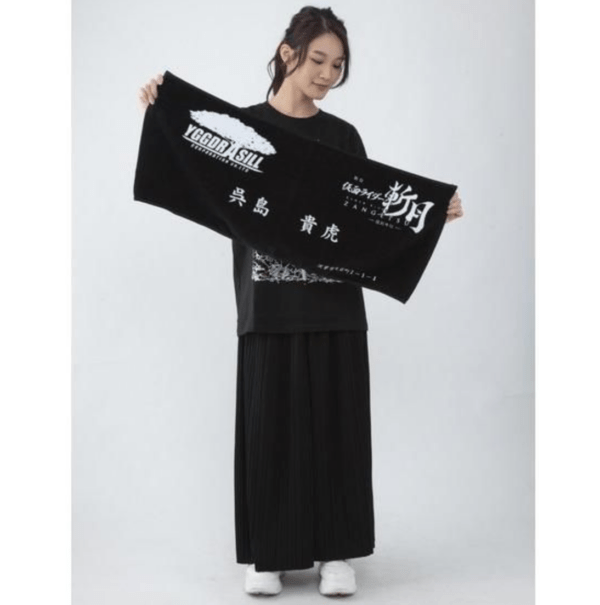 The Kamen Rider Zangetsu -Gaim Gaiden- Stage Show Takatora Kureshima Business Card Face Towel will go for ¥1,620 (tax included) and is scheduled for shipment in May 2019. 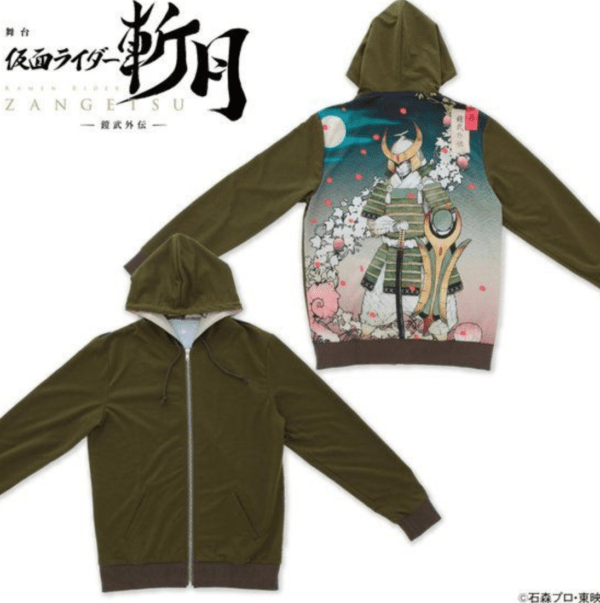 Lastly, we have listed the Kamen Rider Zangetsu -Gaim Gaiden- Stage Show hoodies. 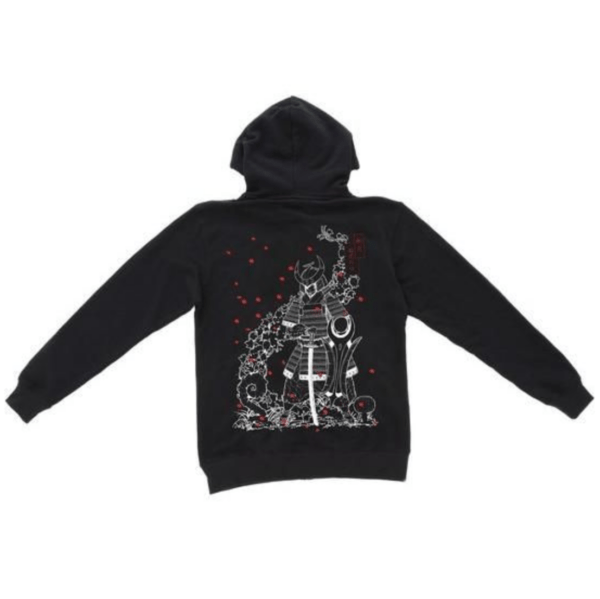 The hoodies come in two designs: Black and White Warlord or Color Warlord. 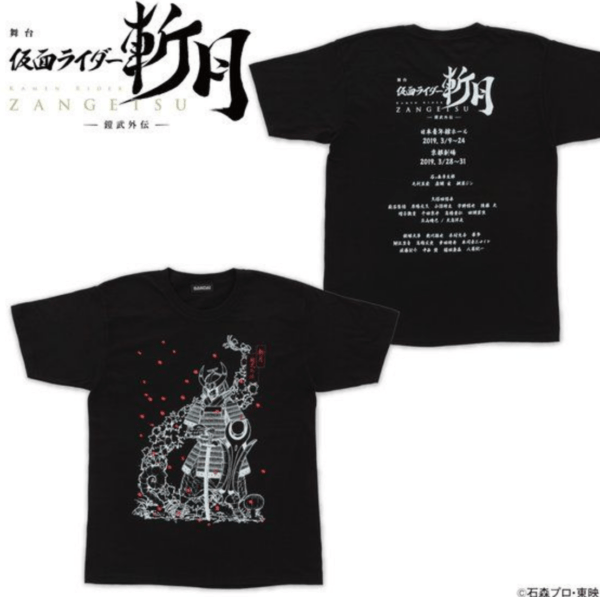 On the front of the black and white design is the Kamen Rider Zangetsu logo as well as the Kamen Rider Zangetsu -Gaim Gaiden- Stage Show title while the back shows a black and white image of Warlord Zangetsu with red flower petals falling around him in an Ukiyo-e-style illustration. 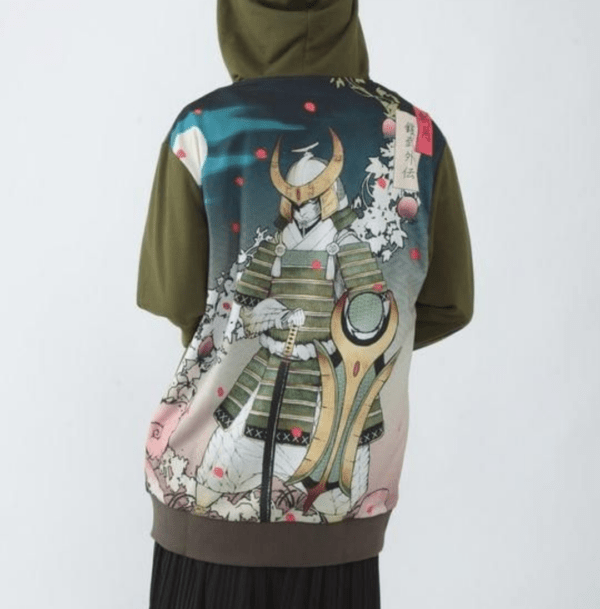 The second hoodie design has printed on the back a full-color illustration of Warlord Zangetsu in Ukiyo-e-style. 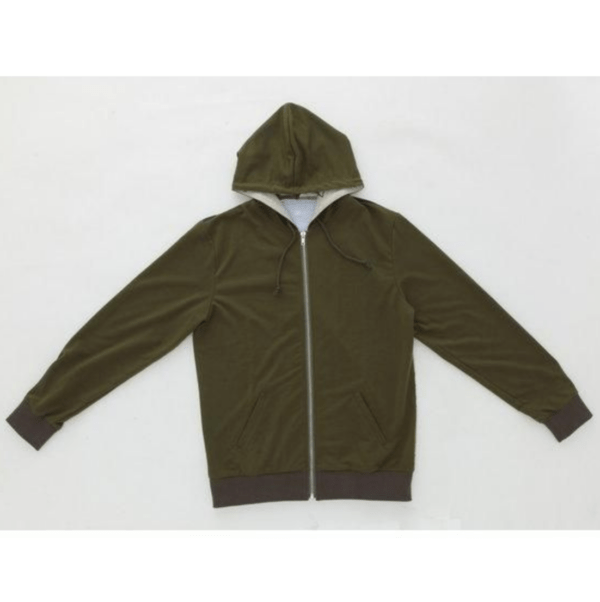 The material uses mini fleece so the hoodies are easy to wear all season. 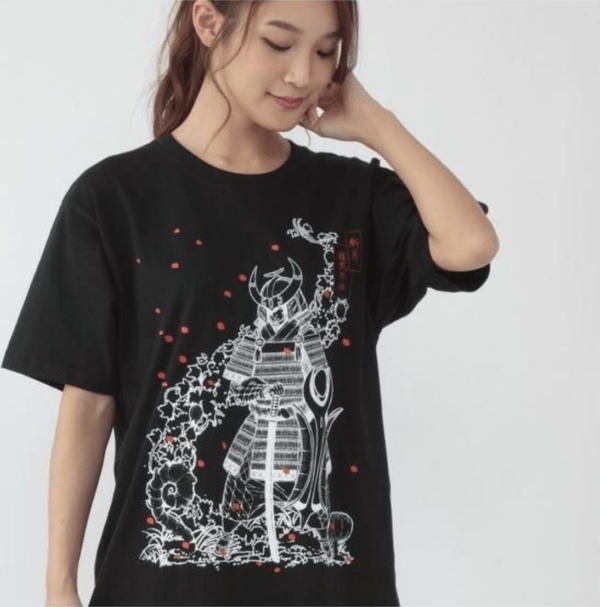 The black and white design is made of 100% cotton while the full-color design is 100% polyester on the body while 95% cotton and 5% polyurethane on the ribs. 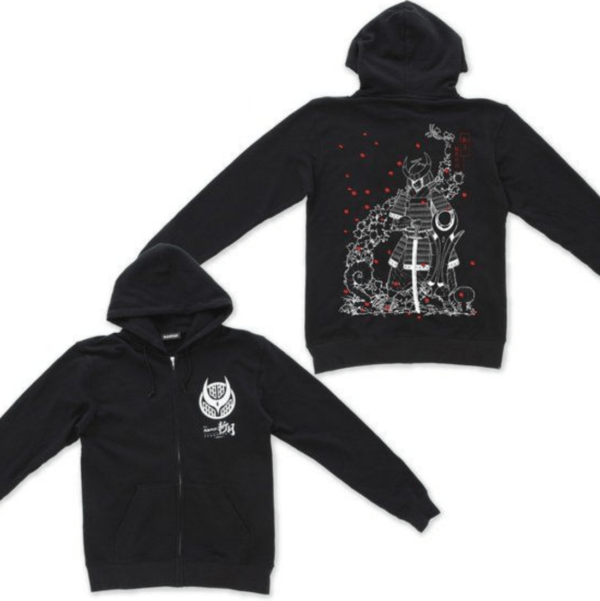 Both hoodies come in sizes M (US S), L (US M), and XL (US L). 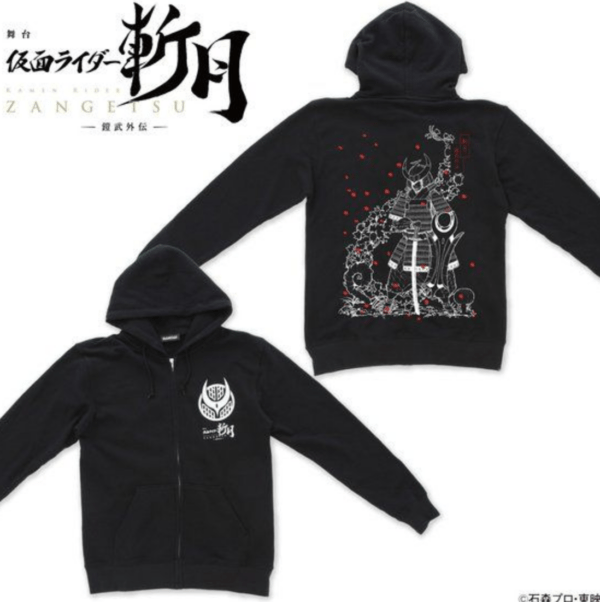 The Kamen Rider Zangetsu -Gaim Gaiden- Stage Show Black and White Hoodie will go for ¥6,480 (tax included) and is scheduled for shipment in May 2019. 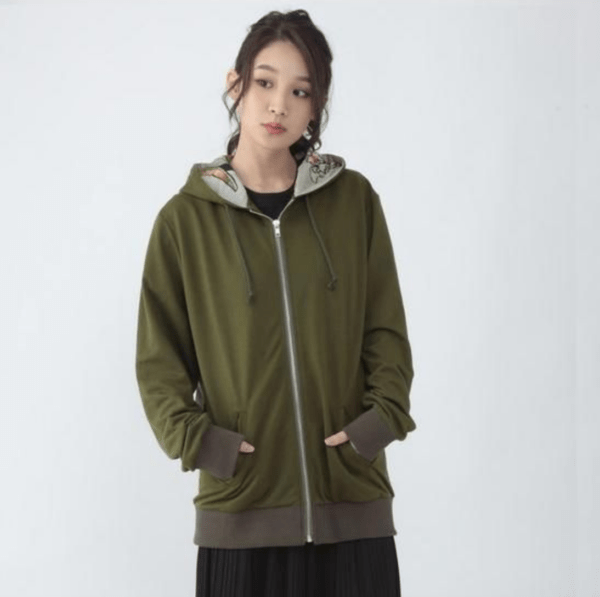 The full-color hoodie, on the other hand, will go for ¥9,720 (tax included) and is scheduled for shipment in July 2019. Love the design on the Handkerchief and Green hoodie. 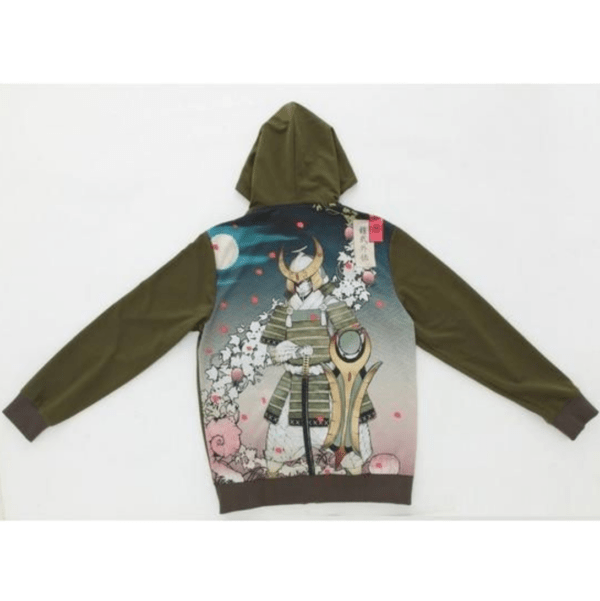 Might just be my first fashion merch.